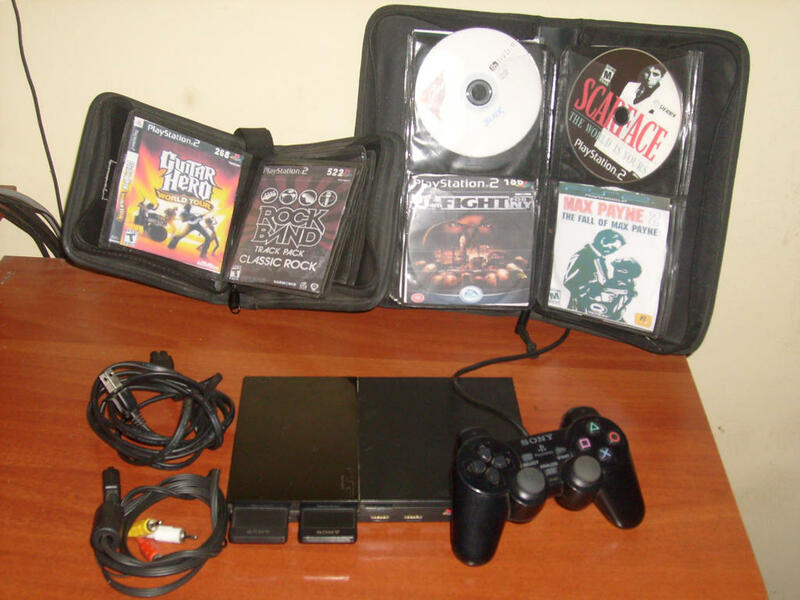 Vendo Play Station 2 + 2 Memorys (8mb) Y 2 Estuches - ... en Taringa! con mini ventilador trasero, no necesita transformador, solo enchufe directo, pero si un adaptador para las patitas americanas, Tiene menos de un año, está desbloqueado y con Chip matrix instalado. Cartuchera 1 (solo guitar heros & Rock bands) : Guitar hero 1, Guitar hero 2, Guitar her 80's, Guitar hero 3, Guitar hero Rock Chileno, Guitar hero iron maiden, Guitar hero World Tour, Guitar hero Aerosmith, Guitar hero System Of A Down, Guitar hero Rock band 2 edition, Rock band AC/DC (Live), Rock band Classic rock, Rock band Country y Rock band Track pack Volume2. Cartuchera 2: Avatar, God of War II, Resident evil 4, The punisher, Prince of Persia Trilogy (incluye 3 juegos de Prince of persia), Dragon Ball Z Infinite World, Total overdouse, Need for Speed Most Wanted, GTA San andreas (armageddon), Dragon ball AF, Mortal Kombat Kombat Armageddon, Conflict deser storm, Terminator 3, Conflict Vietnam, The Warriors, GTA Vice city, Indiana Jones and the Staff of kings, Transformers revenge of the fallen, Backyard Wrestling (don't try this at home) Urban Chaos, Yakuza, Mortal kombat Shaolin monks, Dragon ball Z boducaitenkaichi 2, Final Fight "Streetwise", Dragon Ball Z Sagas, Black, Def Jam Fight for NY, Scarface "The world is yours", Max payne 2 The Fall Of Max Payne, Full metal alchemist 2 "Curse of the Crimson Elixir" y El padrino. Asi que pienzenlo bien, el play station 2 + 1 joystick y 1 memory me costaron $80.000 y estoy vendiendo eso mas una memory, dos cartucheras, un montón de juegos, desbloqueo y Chip matrix a $75.000 !!! Les doy mi correo si lo quieren agregar y lo conversamos mejor. Tambien vendo una guitarra GH modelo explorer a 10 lukitas, con caja y todo!